I made this hanging pot plant holder last Sunday. Once I had all the bits together (which took me about three weeks, not because they’re hard to get, just because I don’t get to hardware stores often) it was really easy – the hardest part was choosing a plant and a non-dripping container for it to sit in. This is a hoya, which we chose because it has beautifully shaped variegated leaves and apparently it will do ok inside (but won’t flower unless it gets good sunlight, which it won’t)… and because my mum and dad have a hoya which I love. 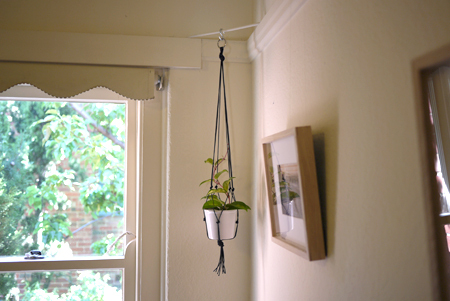 There’s a tutorial for this “not too desperately retro” macrame hanger and some inspiring photos on Skinny Laminx.